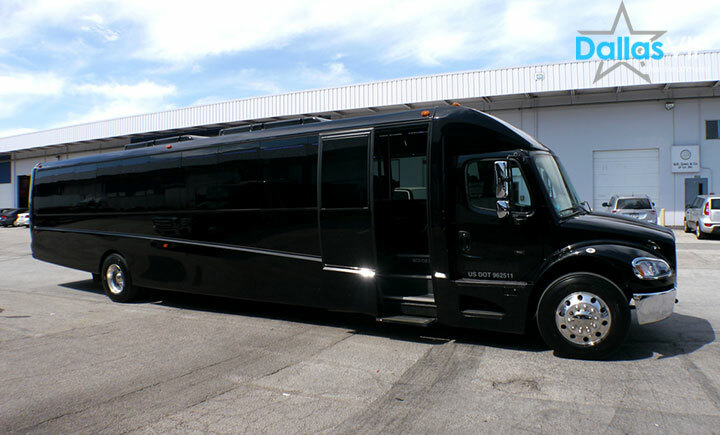 When you need to transport a large group of people, DallasVIP can accommodate your needs. 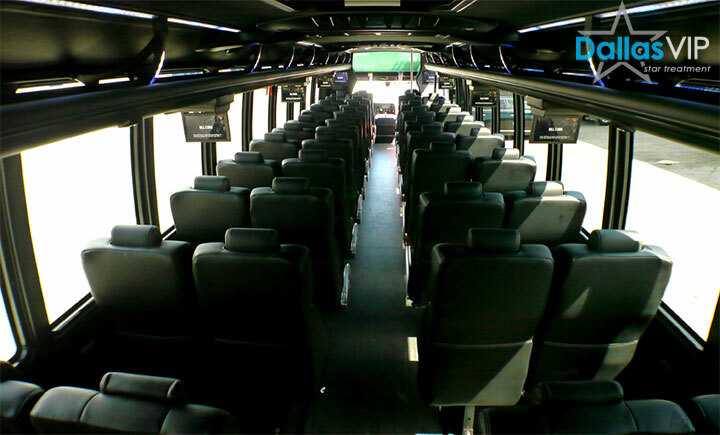 Our large group transportation vehicle has the capacity to hold up to 50 passengers comfortably. Whether you need a vehicle at an hourly, daily, or one-way ride rate, our staff can help make your transport smooth and affordable. The oversized luxury vehicle features only the best in construction and amenities. Enjoy plush seating, large tinted windows, tables areas, and numerous televisions that let you watch the big game or your favorite films. If you’re traveling with a large group, there’s no better way to get there than with our large group transportation vehicle. Traveling with a group of people is not always easy, especially when you have to take separate vehicles. Traveling together as a group in a single vehicle can save you stress and time, as everyone will arrive and depart at the same time. With an experienced driver in the front seat, you also won’t have to worry about directions, parking, or getting a designated driver. Our professional drivers will get you to and from your destination safely and as effectively as possible. Best of all, our Large Group Transportation vehicle is available 24 hours a day, seven days a week. Just been delegated the task of finding reliable transportation for 40 of your co-workers? No problem, we’ve got you covered. Need a comfortable vehicle to transport your wedding party to and from the reception? Reserve your vehicle today. Our Large Group Transportation vehicle is perfect for all types of situations, including both business and personal events and celebrations. At DallasVIP, moving groups of people is our specialty. For more information about our Large Group Transportation vehicle or to reserve a vehicle for an upcoming occasion, contact us at DallasVIP today. The Super Stretch Limo is a popular choice for birthdays, weddings, and other special occasions. This stylish and sophisticated ride can comfortably fit up to ten passengers with ease and has numerous features for guests to enjoy, such as a leather interior, TV, DVD player, premium sound system, dual AC, tinted windows, privacy partition, and starlight fiber optic lighting. The most notable difference between a standard limo and the stretch model is size. A larger size means more room for on-board entertainment. With the capacity to hold up to 20 passengers, the Stretch Hummer is a massive vehicle with plenty of room for passengers and a variety of entertainment options. Top features include LCD TVs, DVD player, strobe lights, MP3 connectivity, tinted windows, CD sound system, and leather interior. The sleek vehicle has the powerful look of a classic Hummer with the size of a stretch limo. Higher ceilings prevent guests from having to crouch down when entering the vehicle and the mini-club feel allows riders to have fun and relax during transportation. The Party Bus is virtually a club on wheels. It can hold up to 22 to 30 passengers with ease, making it one of the largest limo options in Dallas. It has only the best in on-board features, such as granite top bars, 52” LCD TVs, dance floor, CD and DVD player, home theater surround sound system, leather couch seating, and custom lighting. If you’re able to sacrifice some seating, you can even trade in a few seats for an on-board mini bar complete with your own personal bartender. 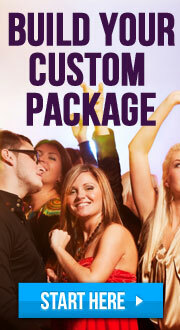 Whether it’s a prom, wedding, or other major event, there’s no experience quite like a party in the Luxury Limo Bus. 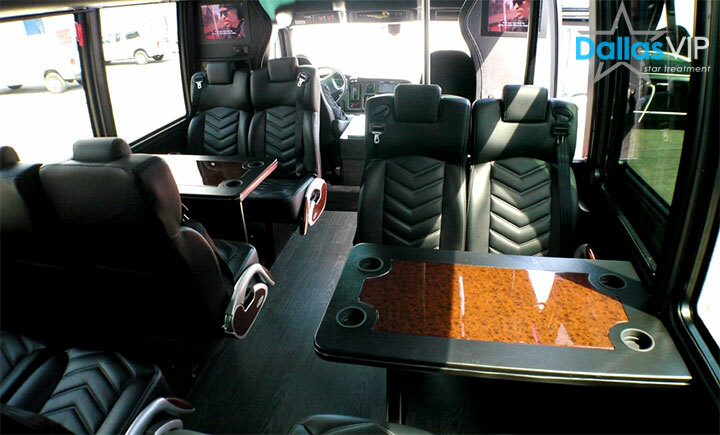 Equipped with leather couch seating, 52” LCD TVs, DVD and CD player, and other fun amenities, the Luxury Limo Bus offers everything you need in a luxury vehicle. Sit back and relax as you’re transported to a sporting event or other activity. 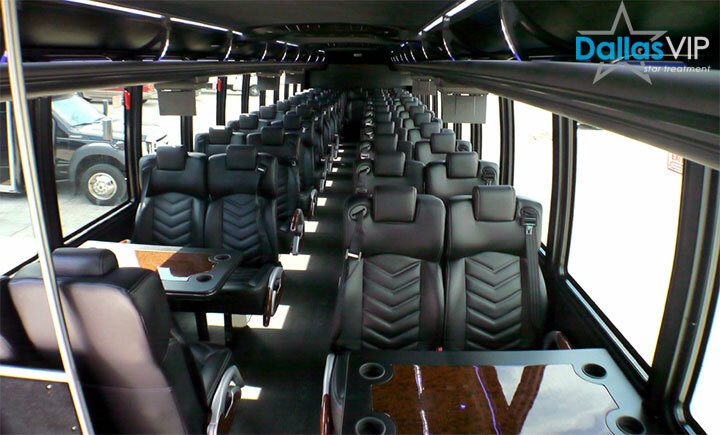 The Limo Bus is also the perfect solution for corporate gatherings. You can rest assured that everyone in your group will arrive to your destination on time and together. Perfect for airport transfers and other group transports, Shuttle Service offers large groups convenience and affordability. The oversized shuttle has a total capacity of up to 23 people and has great features like 52” LCD TVs, CD and DVD player, and leather couch seating. Each of the premium seats faces forward to give passengers a great view of the television screen that has been built into the privacy partition. Watch your favorite films as you are safely transported to your destination. Amongst the biggest limo vehicles in Dallas is the Coach Bus. This gigantic vehicle can fit up to 50 passengers with plenty of room leftover to accommodate great on-board features like a premium sound system. It also has plenty of room for luggage, as well as a private bathroom. The Coach Bus is the perfect solution for individuals in need of group transportation for airport transfer, weddings, bachelor and bachelorette parties, business functions, and more. Rode a Large Groups Transportation? Share your experience with others! Planning a trip to Dallas or have an exciting opportunity coming up? When in Dallas, you’ll likely have to consider numerous factors, such as where you’ll be staying and eating. Amongst the most important factors for large groups is transportation. When trying to transport a large group in Dallas, your average taxi cab or rental vehicle just won’t do. You need a massive vehicle that will not only accommodate all of your guests, but also provide a safe and comfortable ride. Here’s a look at some of the very best options for limo transportation for large groups in Dallas.